The morning after your bachelor party will likely require a few cups of coffee, so prepare your groomsmen for the next morning with these personalized coffee mugs. Each mug can be personalized with your groomsman's first name and the year. 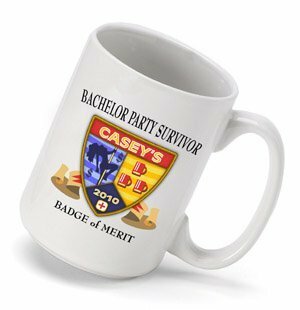 He will have earned his "Badge of Merit" for surviving your bachelor party! Ceramic mug holds 15 ounces.